The Fourier transform is a representation of an image as a sum of complex exponentials of varying magnitudes, frequencies, and phases. 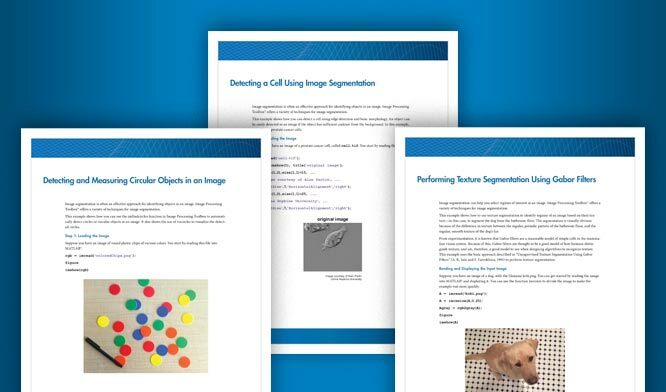 The Fourier transform plays a critical role in a broad range of image processing applications, including enhancement, analysis, restoration, and compression. Roughly speaking, this equation means that f(m,n) can be represented as a sum of an infinite number of complex exponentials (sinusoids) with different frequencies. The magnitude and phase of the contribution at the frequencies (ω1,ω2) are given by F(ω1,ω2). To illustrate, consider a function f(m,n) that equals 1 within a rectangular region and 0 everywhere else. 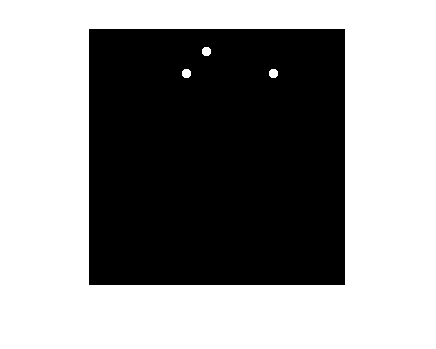 To simplify the diagram, f(m,n) is shown as a continuous function, even though the variables m and n are discrete. of the rectangular function shown in the preceding figure. The mesh plot of the magnitude is a common way to visualize the Fourier transform. 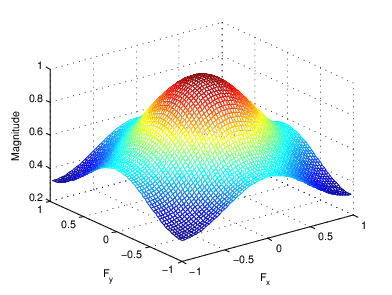 The peak at the center of the plot is F(0,0), which is the sum of all the values in f(m,n). The plot also shows that F(ω1,ω2) has more energy at high horizontal frequencies than at high vertical frequencies. This reflects the fact that horizontal cross sections of f(m,n) are narrow pulses, while vertical cross sections are broad pulses. Narrow pulses have more high-frequency content than broad pulses. as an image, as shown. Using the logarithm helps to bring out details of the Fourier transform in regions where F(ω1,ω2) is very close to 0. Examples of the Fourier transform for other simple shapes are shown below. The input and output of the DFT are both discrete, which makes it convenient for computer manipulations. There is a fast algorithm for computing the DFT known as the fast Fourier transform (FFT). The MATLAB functions fft, fft2, and fftn implement the fast Fourier transform algorithm for computing the one-dimensional DFT, two-dimensional DFT, and N-dimensional DFT, respectively. The functions ifft, ifft2, and ifftn compute the inverse DFT. The DFT coefficients F(p,q) are samples of the Fourier transform F(ω1,ω2). Construct a matrix f that is similar to the function f(m,n) in the example in Definition of Fourier Transform. Remember that f(m,n) is equal to 1 within the rectangular region and 0 elsewhere. Use a binary image to represent f(m,n). Compute and visualize the 30-by-30 DFT of f with these commands. This plot differs from the Fourier transform displayed in Visualizing the Fourier Transform. First, the sampling of the Fourier transform is much coarser. Second, the zero-frequency coefficient is displayed in the upper left corner instead of the traditional location in the center. To obtain a finer sampling of the Fourier transform, add zero padding to f when computing its DFT. The zero padding and DFT computation can be performed in a single step with this command. This command zero-pads f to be 256-by-256 before computing the DFT. The zero-frequency coefficient, however, is still displayed in the upper left corner rather than the center. You can fix this problem by using the function fftshift, which swaps the quadrants of F so that the zero-frequency coefficient is in the center. The resulting plot is identical to the one shown in Visualizing the Fourier Transform. This section presents a few of the many image processing-related applications of the Fourier transform. The Fourier transform of the impulse response of a linear filter gives the frequency response of the filter. The function freqz2 computes and displays a filter's frequency response. The frequency response of the Gaussian convolution kernel shows that this filter passes low frequencies and attenuates high frequencies. See Design Linear Filters in the Frequency Domain for more information about linear filtering, filter design, and frequency responses. This example shows how to perform fast convolution of two matrices using the Fourier transform. A key property of the Fourier transform is that the multiplication of two Fourier transforms corresponds to the convolution of the associated spatial functions. This property, together with the fast Fourier transform, forms the basis for a fast convolution algorithm. Note: The FFT-based convolution method is most often used for large inputs. For small inputs it is generally faster to use the imfilter function. Create two simple matrices, A and B. A is an M-by-N matrix and B is a P-by-Q matrix. Zero-pad A and B so that they are at least (M+P-1)-by-(N+Q-1). (Often A and B are zero-padded to a size that is a power of 2 because fft2 is fastest for these sizes.) The example pads the matrices to be 8-by-8. Compute the two-dimensional DFT of A and B using the fft2 function. Multiply the two DFTs together and compute the inverse two-dimensional DFT of the result using the ifft2 function. Extract the nonzero portion of the result and remove the imaginary part caused by roundoff error. This example shows how to use the Fourier transform to perform correlation, which is closely related to convolution. Correlation can be used to locate features within an image. In this context, correlation is often called template matching. Read a sample image into the workspace. 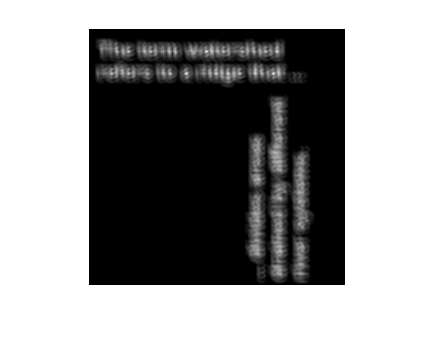 Create a template for matching by extracting the letter "a" from the image. Note that you can also create the template by using the interactive syntax of the imcrop function. Compute the correlation of the template image with the original image by rotating the template image by 180 degrees and then using the FFT-based convolution technique. (Convolution is equivalent to correlation if you rotate the convolution kernel by 180 degrees.) To match the template to the image, use the fft2 and ifft2 functions. In the resulting image, bright peaks correspond to occurrences of the letter. imshow(C,) % Scale image to appropriate display range. thresh = 60; % Use a threshold that's a little less than max. imshow(E) % Display pixels with values over the threshold.